The John Erickson Museum of Art (JEMA) is pleased to present Kevin B. Chen’s exhibition, The View From There. Chen is an artist based in Oakland, CA. 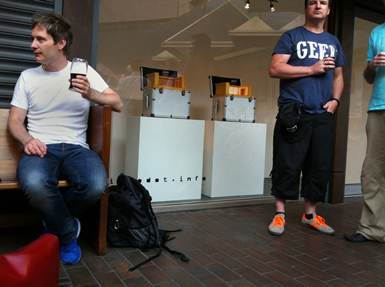 His JEMA exhibition most recently opened at Microdot Gallery, in Belfast, Northern Ireland, from July 19th – August 2nd, 2013. Thanks to Brendan Jamison and David Turner for traveling the exhibition to Microdot. David Turner is the founder of Microdot Gallery and also a Belfast-based artist and curator. To view the opening at Microdot Gallery see the links below. 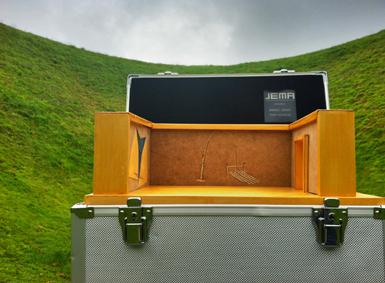 JEMA is pleased to announce Paraic Leahy’s exhibition, Tight Squeeze. Annette Moloney, JEMA’s curator for this exhibition, traveled Leahy’s Tight Squeeze exhibition to take part as a show-within-a-show-within-a-show in The Museum of Miniature exhibition organized by artists and curators Tess Leak + Marie Brett at the Skibbereen Arts Festival, Co Cork, Ireland, July 28th – August 4th, 2012. More recently, Tight Squeeze was on view at Microdot Gallery, in Belfast, Northern Ireland, from July 19th – August 2nd, 2013. Thanks to Brendan Jamison and David Turner for traveling the exhibition to Microdot. The John Erickson Museum of Art proudly announces new images of the JEMA Annex activities in Florida. The Annex re-opened on JEMA museum grounds on Thursday, October 8th, 2009, at the Samuel P. Harn Museum of Art in Gainesville, FL. Each Annex facility is a mobile, semi-autonomous, multi-functional, project space. The Annex operates in a largely self-directed manner in terms of structure, mission, and exhibitions. During hours of operation the Annex is composed of Annex Consultants who act to conceive, construct, create, and operate this new venue. The architecture of the Annex is formed from the Annex Consultants, their clothing, string, and whatever else they deem viable to maintain their exhibition space. Body language, movement, pre-existing art/architecture, and thread assist in conveying and defining the goals, exhibitions, and programs that are produced at the Annex. JEMA Annex Consultants included Charisse Calaquian, Leah Floyd, Ladis Pietros, Kelly Rogers, and Matthew Whitehead. The Annex exhibited “New Works” by Kelly McCafferty and their activities were documented by photographer, Jayanti Seiler. Alfred H. Barr, the 1st Director of the Museum of Modern Art in NY, stated, “Basically, the Museum “produces” art knowledge, criticism, scholarship, understanding, taste… once a product is made, the next job is distribution. An exhibition in the galleries is distribution. Circulation of exhibition catalogs, memberships, publicity, radio, are all distribution.” When the Annex is in operation, the Annex consultants determine what the Annex will “produce” and prioritize the levels of production. JEMA provides clerical supplies as well as institutional support for Annex Consultants. On June 16th , 2009, Belfast-based sculptor, Brendan Jamison, JEMA staff, and museum-goers assembled at Queen Street Studios Gallery in Belfast, Northern Ireland and ceremoniously prepared Jamison’s Reichstag Zuckertüte Kuppel (Reichstag Sugar-cube Dome) for travel to Berlin, Germany. In commemoration of the 10th anniversary of the construction of the Norman Foster’s dome addition to The Reichstag, JEMA invited Jamison to build a sugar-cube version of this state-of-the-art glass and metal edifice. In homage to the iconic 1995 wrapping of The Reichstag (then domeless) by Christo and Jeanne-Claude, JEMA Director Sean Miller commissioned the production of a special wrapping fabric to cover the entire sugar sculpture and a small wrapping event was arranged for Jamison’s dome at JEMA and Queen Street Studios Gallery. Participants in the event included: Sculptor Brendan Jamison, Belfast’s Chief JEMA Exhibition Technician Emma Connolly, QSS Gallery Director Brendan O'Neill, Flax Art Studio Manager Eleanor Phillips and Assistant Exhibition Technician Georgina Jackson. On Sunday, June 28th, at 8:30 pm, Reichstag Zuckertüte Kuppel was delivered, unwrapped, unveiled, and exhibited at Platz der Republik, The Reichstag, Berlin. Several months later, on Tuesday, September 8th, 2009, Jamison and JEMA traveled Reichstag Zuckertüte Kuppel to the Samuel P. Harn Museum in Gainesville, FL. to begin its U.S. tour. On March 11th, 2009, JEMA staff arrived in Genoa, Italy with the exhibition Art Museum Dust Collection by Kelly Cobb and Connie Hwang. JEMA Director Sean Miller, and Art Museum Dust Specialist, LuLu LoLo, proudly traveled the exhibition in a series of museum interventions organized by Genoa-based curator Caterina Gualco of UnimediaModern Contemporary Art. Art Museum Dust Collection was exhibited at the following institutions as a part of a series of interventions organized by Genoa-based curator, Caterina Gualco. JEMA staff were officially scheduled to collect art museum dust at the following institutions: Villa Croce Museo d'Arte Contemporanea, Museo di Strada Nuova, Galleria d’Arte Moderna of Genoa, Nazionale di Palazzo Spinola, l'Aula Magna dell'Università di Genova, and UnimediaModern Contemporary Art. LuLu LoLo and Sean Miller collaborated with staff and visitors of these institutions to obtain museum dust from their prestigious collections. In addition, LuLu LoLo and Sean Miller met with viewers and staff to discuss the history of the Art Museum Dust Collection, explained various dust collection techniques, offer museum tours, and LuLu LoLo performed: LULU LOLO In A DAY IN THE LIFE OF AN ART MUSEUM DUST COLLECTOR (Commedia dell’ Arte Raccolta Polvere). This short performance was delivered in the style of Commedia dell’Arte and detailed the trials and tribulations of being an Art Museum Dust Collector while encouraging audience participation. In addition to their traveling exhibition in Genoa, Italy, Cobb and Hwang’s Art Museum Dust Collection exhibition has traveled to Spazio Utopia Contemporary Art, in Campagna, Italy (2008) and the Museum of Arts and Sciences, Macon, Georgia (2008). On August 8th, 2008, LuLu LoLo, JEMA’s new Dust Collecting Specialist, opened her JEMA exhibition, Sculpting and Collecting Campagna, at Spazio Utopia Contemporary Art, in Campagna, Italy. This project coincided with Campagna’s annual Rassegna Dell'Acqua-La Chiena exhibition curated by Angelo Riviello. For this exhibition, LuLu LoLo declared the entire town of Campagna a work of art. Performing as a sculptor, collector, archeologist, and conservator - LuLu LoLo worked to dust, maintain, and celebrate Campagna (down to the smallest particle). The collected bits of Campagna were archived in a new JEMA gallery, lined with shelves, cases, and vials to hold and organize the dust. As LuLu dusted Campagna, she traveled her JEMA exhibition through the town, met citizens, conducted research, and offered JEMA museum tours to viewers. Performing as a museum collector and sculptor, LuLu imported Campagna’s finest dust into JEMA’s collection. On May 11th, 2008 JEMA Director Sean Miller, proudly transported the Andrea Robbins and Max Becher photographic exhibition, Bavarian By Law is in Place, to the 2008 Maifest Celebration and Parade in Leavenworth, Washington. Robbins and Becher’s exhibition documents the same annual Maifest Celebration in Leavenworth that was held in 1995. In an attempt to identify with his museum’s new audience Miller dressed in the neo-traditional Lederhosen worn by citizens and visitors to Leavenworth, Washington. When Sean Miller joined the Maifest Parade procession the subject matter of the photos in JEMA and the cultural / geographical context of the traveling exhibition aligned. Bavarian By Law was in place. During the month of April, Belfast’s newest museum, The John Erickson Museum of Art (JEMA), proudly presented an exhibition by Gregory Green. The public was invited to visit JEMA, join a new nation, and view the new Belfast consulate for Gregory Green’s New Free State of Caroline. 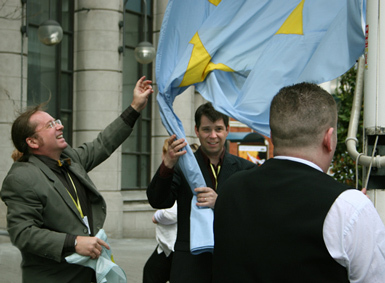 On April 1st, 2008, Museum Director, Sean Miller was bestowed with the honor and title of Consul General for the New Free State of Caroline in the City of Belfast. In addition, JEMA was given the privilege and duty of housing the Official Belfast Consulate for the New Free State of Caroline. Gregory Green founded the New Free State of Caroline in 1996 when he sent a letter to the United Nations and World Court laying claim to an uninhabited island 500 miles south of Tahiti. The U.N. acknowledged that Green’s letter was received however in 1999 Kiribati was given sovereignty over the disputed island. Despite the loss of claim to the island, Caroline continues to attract new citizens and consider new islands. Gregory Green and Sean Miller traveled the Caroline Consulate throughout the city of Belfast. They met with citizens, accepted interviews, met with military personal, held a flag-raising ceremony at the Europa Hotel, and traveled to various cultural/political sites for diplomatic purposes. In addition, Green arranged to issue the first passport of the New Free State of Caroline to, Belfast resident, Caroline Pugh. On April 5th-29th, 2008, the John Erickson Museum of Art proudly traveled Yoko Ono’s exhibition IMAGINE PEACE to Belfast, U.K. IMAGINE PEACE was exhibited at Flaxart Studios, Golden Thread Gallery, and Catalyst Art Gallery. During April JEMA further exercised its location variable capabilities and traveled Ono’s exhibition to numerous locations in Belfast and the U.K. including: Belfast City Hall, NvTv Studios, Ulster Museum, University of Ulster, Europa Hotel, a “Peace Wall” in Belfast, Belfast’s Political Murals, residential neighborhoods, and the Glasgow School of the Arts. Yoko Ono’s IMAGINE PEACE is a project with a message that, despite its minimal simplicity, poses a challenge to the current U.S. foreign policy. Ono’s exhibition at JEMA was organized with this notion as a strong motivating factor. However, due to scheduling, it coincided with JEMA’s visit to Belfast, Northern Ireland. This seemed like an interesting context for IMAGINE PEACE since the current political condition in Belfast is being widely described as “post conflict. JEMA staff considered that perhaps this international traveling exhibition experienced in this location might offer fresh perspectives and insights to U.S. viewers, and encourage an international dialogue about the nature of peace, politics, and art. In August 2007, the John Erickson Museum of Art completed the construction of our new wing of galleries. On September 8th, 2007, between 4-5 pm, JEMA opened four exhibitions in the new galleries in SoHo, NY, NY. Our new galleries and the exhibitions therein, traveled on route from Houston and West Broadway South to Grand, then left and right on Wooster ending at Deitch Projects (18 Wooster). These traveling exhibitions were included in Art Parade 2007 sponsored by Deitch Projects, Creative Time, and Paper Magazine. JEMA’s Director, Sean Miller, curated the four exhibitions to travel in Art Parade 2007 including a new drawing-based installation by Arnold Mesches entitled Coming Attractions 2: Man-Made, Guards by John Kieltyka, audience by Saya Moriyasu, and 100 Paces by Sean Taylor. These JEMA exhibitions explored themes relating to audience, walking, marching, parading, exhibiting, viewing, and guarding art. During April and May, 2007, JEMA’s gallery space hosts a series public discussions, led by Kristin Lucas, seeking to discover Outside. This public forum project, by Lucas, is co-supported by the ACC Galerie, Weimar, Germany and JEMA. Lucas is utilizing public and online forums to assemble a Search Party comprised of discussants, residents, and visitors in Weimar. Lucas is currently working with the Search Party to develop techniques and strategies to locate Outside. The team is traveling throughout Weimar and surrounding areas to follow-up on leads, paths, and frames of mind that may lead outside. JEMA’s architectural form compliments the function of Search Party by providing a common mobile meeting place for participants. In time, JEMA will exhibit the residue and results of Kristin Lucas's efforts to assemble a Search Party to discover Outside in Weimar. On February 24th, 2007 from 11am-4pm, JEMA held a sneak preview for Sean Taylor’s video installation 100 Paces. The video 100 Paces documents a site-specific drill/choral composition created by Sean Taylor that utilizes drills, songs, and movements that are common to soldiers of the Irish Defense Forces. This site-specific work was a collaborative effort involving a platoon of soldiers from the Irish Defense Forces. The National Museum of Ireland at Collins Barracks, Dublin was the site that inspired Taylor’s 100 Paces project and the location where the video was produced. The museum was once a military barracks and the barracks is built around a large open square (Clarke Square) where military drills once took place. The acoustics in the square and pace markers on the walls became a genesis for the Taylor’s project. As JEMA traveled Taylor's video installation into the National Museum of Ireland and around Clarke Square, a platoon of Irish soldiers presented three live performances (in the square) of Sean Taylor's unique physical choral/drill composition. On December 8th-9th, 2006, Saya Moriyasu’s audience worked with JEMA’s location variable abilities and simultaneously became an art venue and art audience in Miami. The John Erickson Museum of Art literally moved amidst the international art audiences attending Aqua Art Miami, Art Basel, Pulse and other Miami art venues. JEMA’s traveling exhibition benefited from mobility, dedication, and stamina as it sought to move like an ideal art audience. JEMA spent 9 hours visiting and varying its location to numerous art venues and hot spots in the Miami area. The museum’s form complimented its function as it attempted to move audience with style, agility, and actively engage curious viewers. JEMA’s participation in Aqua Art MIami is the result of an invitation from SOIL collective and gallery and curator Jess Van Nostrand. JEMA was pleased to hold Moriyasu’s two minute opening on Friday December 8th from 1:19-1:21pm EST in the SOIL space at Aqua Art Fair. JEMA was equally pleased that for the second year it gained the distinction of having the highest art at Art Basel Miami Beach. On December 9th, 2006, at 2:26pm, Saya Moriyasu's exhibition audience earned the distinction of being the highest art when it made use of JEMA’s location variable abilities to gain the highest art status within the architecture of the Art Basel exhibition venue. The highest art status of audience was not officially sanctioned by Art Basel Miami Beach. JEMA’s “visitor count” in Miami exceeded 400 viewers and the show was traveled to over 70 art venues in a 9 hour period. In October 2006, JEMA opened its latest exhibition at Ice Box Contemporary Art in Tacoma, Washington. JEMA's latest exhibit is an installation by Bethany Taylor titled Emissions and Remissions. Sean Miller and Bethany Taylor traveled to Tacoma for the exhibition. In this site-specific work Taylor uses string as a drawing medium and weaves delicate, transient drawings made from thread. The drawings literally become uncontainable transmissions as they migrate outside of JEMA’s museum space, disperse on to the walls of Ice Box Gallery, and dissipate on to the streets of downtown Tacoma. For more about Taylor’s exhibit visit the JEMA Exhibitions page. On July 29th 2005 at 10:03 am, JEMA held an opening for Mark Takamichi Millers exhibition One Hour Photo Paintings in the Costco Wholesale parking lot in Seattle, WA. Mark Miller displayed five oil paintings derived from anonymous photographic prints he borrowed from Costcos print return bins. Museum Director, Sean Miller read an excerpt from William S. Burroughs Les Voleurs and Mark Miller offered a brief Childrens Tour for JEMA patrons. The event was documented on a disposable camera and left at Costco for processing. Look for One Hour Photo Paintings to travel and JEMA to vary its location for an upcoming exhibition at Howard House in Seattle, WA. Millers opening for JEMA was not endorsed or approved by Costco Wholesale. For more about Millers exhibit visit the JEMA Exhibitions page. Mercer University students preview Cinottos exhibit. 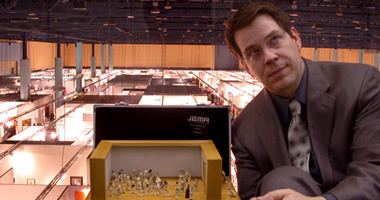 In October 2004, JEMA opened its latest exhibition at Mercer University in Macon, Georgia. JEMA's latest exhibit featured an installation by Laurie Cinotto titled, Limited Space and Creative Living Are Compatible When a Room Works Double Duty. This exhibition went on display at Mercer University's Hardman Hall Gallery. Museum Director, Sean Miller traveled to Mercer to discuss JEMAs location variable equation, Cinotto's exhibition, and the recent online images of its permanent collection with students and faculty. For more about Cinottos exhibit visit the JEMA Exhibitions page. Seán Ó Donnchú with JEMAs Sean Miller. In June 2004, the John Erickson Museum of Art traveled its new permanent collection to Limerick, Ireland. This traveling exhibition was on display at the Limerick City Gallery of Art (LCGA). JEMA extended this permanent collection exhibition to remain on display for the entire month of June. Prior to the official opening a special sneak preview of the exhibition was given to Seán Ó Donnchú T.D., Irelands Minister for Arts, Sport & Tourism. For more about JEMAs Permanent Collection visit The Collection page. JEMA and Lauren Garber's exhibition in holding in were on view at the Lander Art Center in Lander, Wyoming through the month of April. For more about Garbers exhibit visit the JEMA Exhibitions page. JEMA Director, Sean Miller, fields a question from the audience at CAA. The John Erickson Museum of Art recently traveled to Seattle, Washington to take part in the annual College Art Association Conference (CAA). JEMA Director, Sean Miller, presented a paper entitled The John Erickson Museum of Art: A New Museum Space. Millers paper outlined the strengths and challenges associated with a location variable museum. During Millers presentation the audience previewed JEMAs latest exhibition Ways of Seeing Inside Out by Kim Anderson. Andersons exhibit officially opened directly after the presentation in room 925 at the Summerfield Suites Hotel. The opening occurred from 11:03-11:05pm. For more about Andersons exhibit visit the JEMA Exhibitions page. JEMA recently hired a security force that attended both the talk and opening. John Kieltyka of Verkstad Security Systems was present to protect and maintain JEMA. We at JEMA, wish to take this opportunity to welcome Mr. Kieltyka to our little museum staff and thank him for his hard work and meticulous security. Summer Zickefoose breathes in the exhibit at Mandy Sheedys JEMA Opening. The opening for Sheedy's exhibition, The Forces That Make Us Live or Die, was held at the old Micanopy City Cemetery in Micanopy, Florida on Thursday, January 22nd. In attendance were Sean Miller, Steve Panella, Jim Street, Bethany Taylor, and Summer Zickefoose. The viewing of Sheedys new body of work commenced at 12:04pm and ended at 12:06pm. As part of JEMA's location variable equation the exhibition was closed promptly after the opening and driven to Saltworks Gallery in Atlanta, GA and reopened for the exhibition Fourth Ward (curated by Saltworks founder and director Brian Holcombe). For more about Sheedys JEMA exhibit and to view images and read the artists statement, visit the JEMA Exhibitions page. Artist Sergio Vega with JEMA Curator Sean Miller at the High Art Opening. Art Basel Miami Beach is an international art fair, which started last year and rapidly has gained worldwide attention. Art Basel Miami Beach is the U.S. counterpart of Art Basel (Switzerland), which has been the worlds most important annual international art event for the last 34 years. At Art Basel Miami Beach, 176 leading galleries of contemporary art from the Americas, Europe and Asia showed works by over 1000 established and emerging artists. Roughly 30,000 people attended last years event. At 11:30 AM on December 4th, 2003 JEMA met with the people at Arial Banners Inc. JEMA was loaded on to a Piper Pawnee model PA-25-225 aircraft called Lady Luck. JEMA was showing its newest exhibition High Art by Sergio Vega. The plane was piloted by Doug Lundeen and took off at 2:30PM and flew to the Miami Beach Convention Center where it circled overhead for an hour and a half. 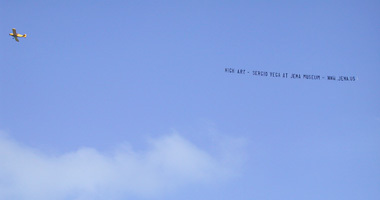 The plane pulled a banner that read: HIGH ART - SERGIO VEGA AT JEMA MUSEUM - WWW.JEMA.US. The plane advertised the museum and carried it simultaneously. It flew as high as 1200 ft. above the convention center making it the highest art at Art Basel (note: Miami Beach is 7 ft. above sea level). Wind was 130 degrees at 20 knots and there was 10 mile visibility - good visibility added to the appreciation of High Art. At 5:21PM JEMA was retrieved from the plane and delivered to the Madonna Building and exhibited at the 39th Annual University of Florida Faculty Exhibition. On December 5th from 6:14-6:16pm Sergio Vegas exhibition High Art officially opened. The location variable museum opened in the Art Basel VIP Lounge in Miami Beach Convention Center. In attendance were Julia Friedman, Sean Miller, Mariko Oikawa, Bethany Taylor, Sergio Vega and numerous VIPs. The exhibition was a great success. Visit the Exhibitions section to view images of the show. JEMA Curator Sean Miller with artist Jesse Paul Miller at the Grand Opening. 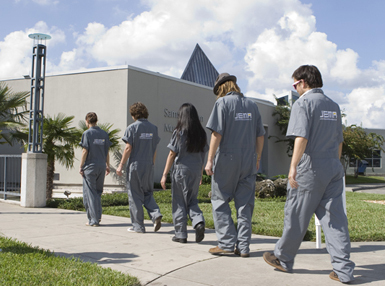 JEMA was officially introduced in March of 2003 at the Museum as Archive, Archive as Museum Symposium held at the Samuel P. Harn Museum of Art in Gainesville, Florida. JEMA was announced as part of Sean Millers presentation/performance Museum Grounds: White Lies, Airborne Dust Bunnies and Maintaining the Appropriate Distance. On July 25th 2003 at 2:40pm JEMA celebrated its Grand Opening in the lobby of the Seattle Art Museum. Openings at JEMA are scaled down in duration appropriate to size. The opening lasted two minutes. In attendance were Jay Bryant, Jesse Paul Miller, Sean Miller, Bethany Taylor, Kassidy Blue Miller and several members of the staff and viewing audience of the Seattle Art Museum. The grand opening was a guerilla action and the Seattle Art Museum did not officially sanction this exhibition or activity. This stated, it is also important to mention and thank some Seattle Art Museum employees who lent a hand to prepare JEMA for its grand opening. Prior to the opening Jesse Paul Miller and Sean Miller met with Phil Stoiber (one of the Seattle Art Museums Registrars) and Michael McCafferty (Seattle Art Museums Chief Exhibition Designer). Stoiber inspected JEMA and McCafferty installed the exhibition (see Installation Images). Much of the JEMA Grand Opening was held beneath the Seattle Art Museums Sol LeWitt wall drawing (see Opening Images). This drawing was commissioned by SAM and executed in 1998. Jesse Paul Miller and Sean Miller functioned as art workers to create the drawing to LeWitts specifications under the direction of LeWitts assistant John Hogan. Sean Miller worked for the Seattle Art Museum from 1995-99. For more about Millers JEMA exhibit and to view images or read the artists statement, visit the JEMA Exhibitions page.